The NEW-for-2017 ALL-DROPSTITCH KXone Slider inflatable kayaks are something of a revolution in the inflatable kayak world. The biggest difference between these and “conventional” inflatable kayaks is that their sides are made from flat (approx 4” thick) high pressure inflatable panels, rather than lower pressure tubes (typically 10” diameter). The extra pressure makes them inherently stiffer, and having thinner sides means they don’t have to be as wide, to get sufficient internal space. Both these features mean they are more hydrodynamically efficient – they go through the water more easily, so you’ll travel noticably further or faster for the same effort. This cutaway diagram probably explains it better than we can say it. The bottom of the kayak is made from 80mm (approx 3″) thick dropstitch material; the sides are made from 100mm (4″) thick dropstitch material. The black “supported” (mesh-reinforced) fabric runs around the outside of the hull, acting as a sort of hinge between the sides and bottom, and fairing off the gap between them. The flat sides cause less drag in the water, compared with a tube of the same height. – the large two person 485 (485cm, 16ft). This model is “officially” only designed for two people but has loads of additional space for camping gear, dogs, children, etc. 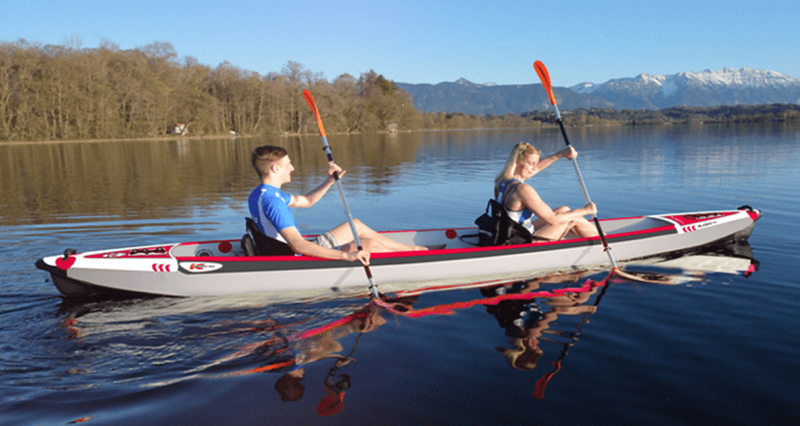 The 445 and 485 are designed so that they can also be used as single person (Solo) kayaks, ie with one seat removed and the other moved towards the middle. The high back seat(s) and footrest(s) are included as standard and are adjustable for angle, position etc. Also included as standard is a very good skeg, although in fact we’ve found that – particularly with the 485 set up as a Solo – the tracking without the skeg is so good that there are circumstances (eg a narrow river) in which you may choose not to fit it! The designers were not messing about. 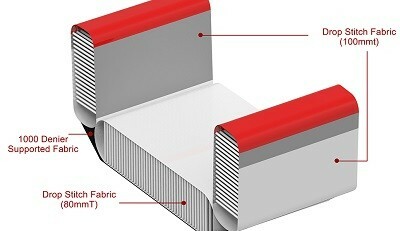 Besides using dropstitch technology for the sides, as well as the floor, they used hard plastic mouldings for the ends. 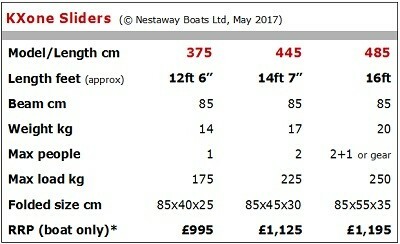 That means the bow and stern shape is really efficient, and the waterline length (which has a direct effect on speed) is maximised. 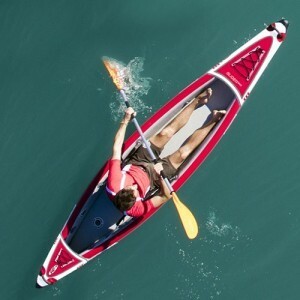 So they’re narrower and more of their length is in the water, which means their length to beam ratio is higher than any other inflatable kayak we can think of. Indeed many people when they first look at the Sliders think they are hard-shell kayaks, and in fact touching them enhances the illusion. The Slider kayaks (boat only) include as standard: boat, seat(s), footrest(s), storage bag, repair kit. 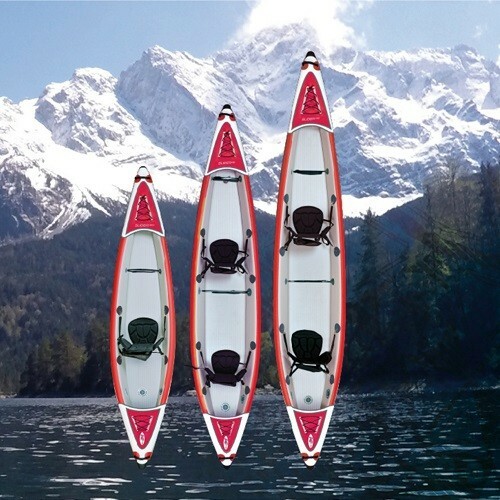 The Slider kayak packages add four-part paddle(s) and a high pressure stirrup pump, so you are ready to go on the water. – a 410 that’s been in the water half a dozen times, nothing wrong with it in terms of usability but has minor cosmetic blemishes etc, at £900 inc paddles and pump. – Performance. The Sliders take it. The Chelans are very good compared with other inflatable kayaks, but the Sliders are faster still. – Tracking (ability to go in a straight line), again both are very good for inflatables but the Sliders win. The Sliders track amazingly well and in shallow waters/low windspeeds, if you are a reasonably accomplished paddler, you could probably get away without the skeg. – Comfort. A win for the Chelans, which have amazingly comfortable seats and pneumatically adjustable bases. The Slider seats are not bad, but the Chelan seats are better. The design of the Chelan seats means you sit a few inches higher (somewhat akin to a sit-on-top), which some people like, and some don’t.